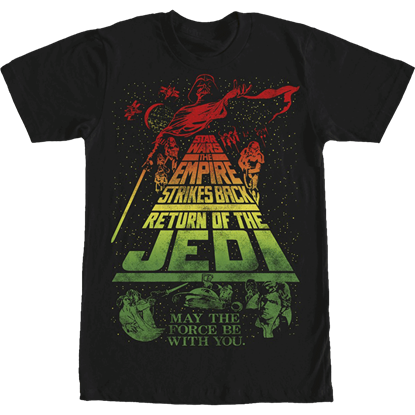 Displaying battles and movie posters from the films, as well as costume shirts, schematics, and humorous riffs, these Star Wars t-shirts are perfect for everyday wear. Medieval We carry a wide variety of Star Wars t-shirts for fans of all ages. The Boba Fett Suit Wraparound T-Shirt makes an excellent casual costume. Wear a schematic style of the spherical astromech droid with The Force Awakens BB-8 shirt, available in blue or gray. Funko has added a chibi twist to several styles, including the Captain Phasma Poster T-Shirt. Classic fans will love the Color Blend Star Wars T-Shirt, which displays the movie titles in the introductory scrolling crawl style. Add a bit of dark humor when you wear the Friends on the Death Star T-Shirt, displaying a stormtrooper helmet with a single tear. The Rogue One Rebel Squadron T-Shirt shows the ragtag crew tasked with stealing the Death Star plans from the Galactic Empire. 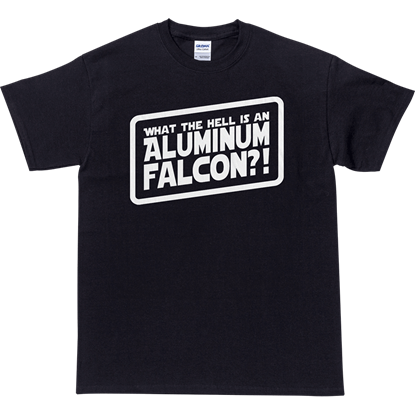 Whether you have been a fan since 1977 or are just starting to enjoy Star Wars, you are sure to find a t-shirt to add to your collection. BB-8, the feisty droid in The Force Awakens, is shown superimposed over a stylized background and text reading BB-8 as well as Aurebesh symbols for Astromech Droid. 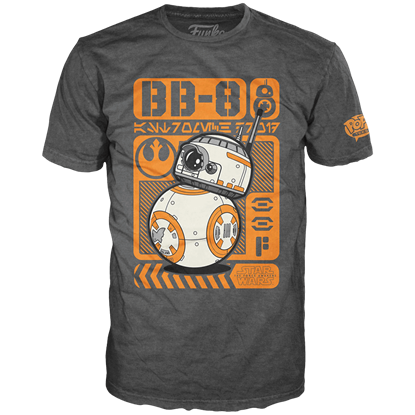 Roll on over and get your own the BB-8 Droid Poster T-Shirt. In the classic film series Star Wars, the Galactic Empire replaced a republic and entrenched its rule through brute force and fear. 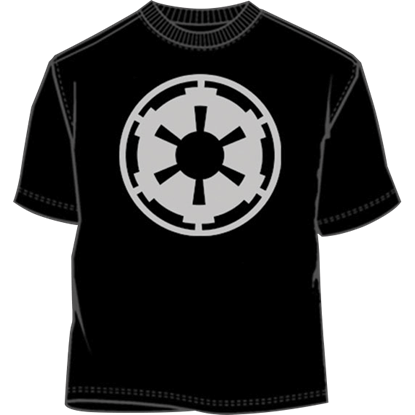 The Black Galactic Empire T-Shirt is an excellent way to show support for this takeover. Captain Phasma stands with blaster raised, a shining example of discipline as depicted on this propaganda style graphic encouraging viewers to join the New Order. 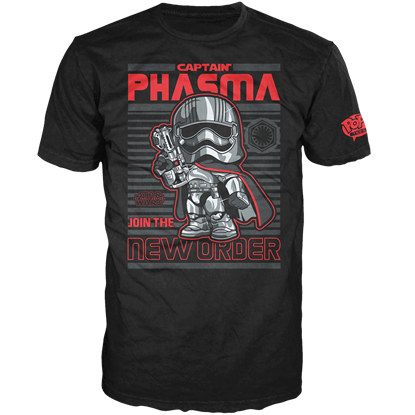 The Captain Phasma Poster T-Shirt is fantastic for any Star Wars fan. R2-D2 may have a number of gadgets to aid him in saving the galaxy, but his bravery is what makes this droid a favorite sidekick to several members of the Rebel Alliance. 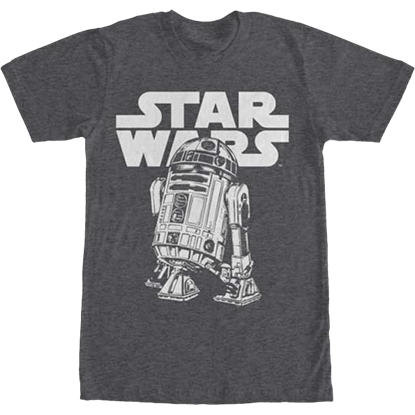 This Classic R2-D2 T-Shirt depicts the robot in vintage style. Some things just do not need a fancy symbol. Star Wars, for all its popularity, had a rather straight-forward logo - the words Star Wars in bold lettering. This Classic Star Wars Logo T-Shirt reproduces that logo for you to wear. Over the years, the Star Wars films have produced countless iconic phrases and images that have become the favorites of science fiction fans. Display these touchstones in eye catching colors with the Color Blend Star Wars T-Shirt! 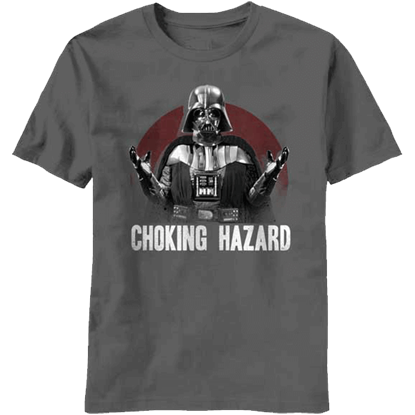 Often demonstrating the ways of the Force on those who disbelieve, this Darth Vader Choking Hazard T-Shirt offers a very valid warning. After all, if Vader finds your lack of faith disturbing, you are likely to wind up gasping for air. Darth Vader is undoubtedly one of the most skilled combatants in the galaxy, his red lightsaber striking fear into souls across the Empire. 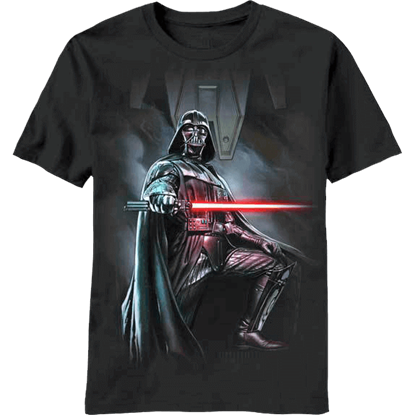 Show your support for this sinister Sith lord with the Darth Vader Light Piercer T-shirt! 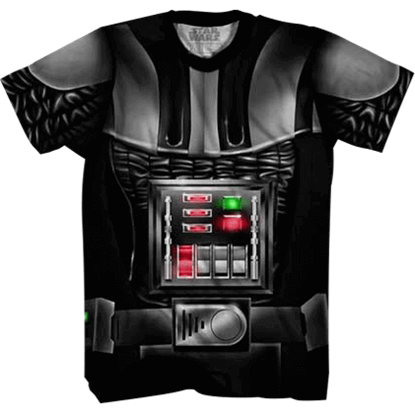 Proudly display your loyalty to the Sith and the Empire as you embrace the look of Lord Vader with the spectacular design of the Darth Vader Suit Wraparound T-Shirt, featuring authentic details to capture the look of his suit. Are you one of the few who are sensitive to changes in the force? 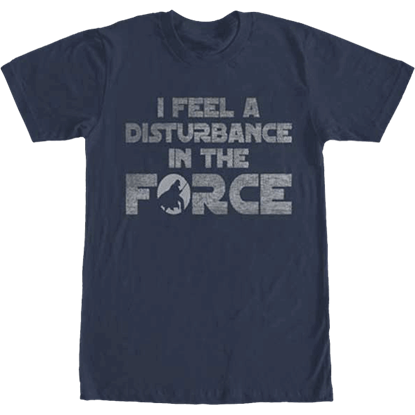 Whether you are or not, this Disturbance in the Force T-Shirt will show your love of Star Wars, and it may just get people thinking that you are one with the force. 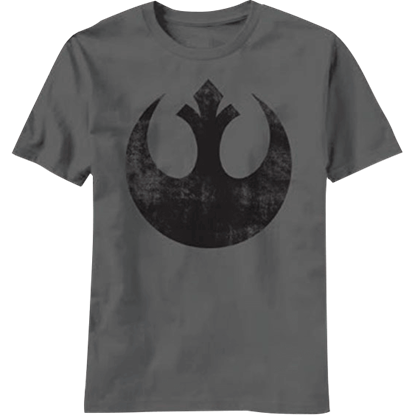 A fantastic way to display your love of the classic Star Wars film series and the rebels who overthrow the evil empire, the Faded Rebel Alliance T-Shirt features a simple design of the rebel symbol on a charcoal gray shirt.